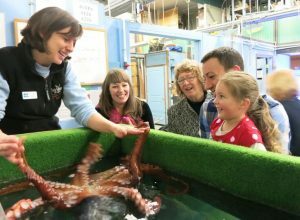 Oregon State University’s Hatfield Marine Science Center will hold its annual Marine Science Day on Saturday, April 8, giving visitors an opportunity to see laboratories behind the scenes, interact with student scientists and learn more about current marine research. The event is free and open to the public, and takes place from 10 a.m. to 4 p.m. at the center, located in Newport southeast of the Highway 101 bridge over Yaquina Bay. It will feature interactive, hands-on exhibits and opportunities to talk with researchers from OSU and other federal and state agencies. The theme is “Celebrating Student Research,” and student scientists will be among the researchers presenting exhibits on marine mammals, oyster aquaculture, ocean acidification, ocean noise, seagrass ecology, fisheries, deep-sea vents and more. Visitors can learn about research diving with the OSU Dive Team, observe microscopic plankton, tour a genetics lab and hear about the NOAA Corps’ 100th year as a commissioned service. Special activities for children will be offered by Oregon Sea Grant and the Oregon Coast Aquarium. The Oregon Coast STEM Hub and representatives from OSU and Oregon Coast Community College will also be available to engage K-12 students interested in pursuing marine studies. Visitors may also learn about the progress of OSU’s Marine Studies Initiative, which seeks to host 500 students-in-residence in Newport by 2025. “With a new teaching and research facility in the fundraising and design phase, Marine Science Day offers a great opportunity to understand why we are so excited about OSU’s Marine Studies Initiative,” said Bob Cowen, director of the Hatfield Marine Science Center. More information about the event is available here.